1. Blowing Leaf - A leaf from the wind-swept ash forest. +4% attack speed. 2. Solar Charm – A stone empowered with the essence of the sun itself. +5% health. 3. Namazu Scale - Remains of the mighty sea monster rom ocean below. +5 power per ninja. 4. Orchid Blossom – A fossilized blossom from the fields of sanctity. +3% health, +3% attack speed. 5. Polished Bubble-Agate – A stone filled with bubbles of mystical vesper gas. +3% health, +3 power per ninja. 6. Phoenix Tear - Te tears of a phoenix are legendary for their focused properties. +4% critical hit chance. 7. Weak Karma Stone – An artifact from the great castle of the Daimyo. +1 Karmaevery 12 hours. 8. 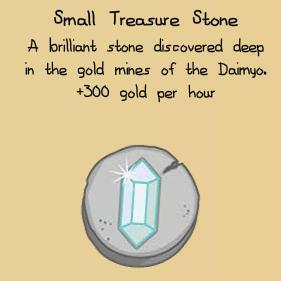 Small Treasure Stone - A brilliant stone discovered deep in the gold mines of the Daimyo. +300 gold per hour. 9. Weak Experience Gem - A beautiful gem that can increase your learning speed. +5% experience gained. 10. Precious Seed – A seed from the great trees of life +10% health. 11. Shadow Emerald – A perfectly cut stone from the masters of the Shadow Clan. +8% attack speed. 12. Fire Rubies – Originating from a volcano, they pulsate with a powerful red energy. +10 power per ninja. 13. Bloodshot Button – A button from the armor of the great Kamakura. +10% health, +10 power per ninja. 14. Taurus Plate - Crafted during the famous Chanoyu ceremony. +10% health, +3% attack speed. 15. Dianthus Flower – Beauty from the borders of eastern Dianthus. +10% health, +5% critical hit chance. 16. Magic Mirror – A mirror that slows down time. +10% critical hit chance. 17. Coal Scales - Believed to be from the rare Coal Dragon. +8 power per ninja, +8% critical hit chance. 18. Phoenix Feather – A feather from a newly risen Phoenix. +1000 gold per hour,. 19. Kotei Rock – This green rock hosts a magic Japanese algae. +10% experience gained, +10% gold won. 20. Asiatic Flower - An offensive pedal that can slow your foes. 11% attack speed. 21. Onogoro Water – Water that has been known to create life and earth. +40 health per ninja. 22. Black Opal Shard - An evil shard that will enhance your skill. +5% health, +4% speed, +5% critical, +10 power per ninja. 23. Craven Rock – A yellow stone that sends fear into your enemies. +30 power perninja. 24. Pure Amethyst – A pure stone that can lift your heart. +1 Karma every 12 hours, +1000 gold per hour. 25. Chaos Emeralds – These emeralds turn thoughts into power. +35 power perninja, +10% critical hit chance. 29. Dragon Eye - A fossilized eye from the Sui-Riu Dragon. +8% health, +15 power per ninja. 30. Kappa Totem – A totem to the fierce imp-like Kappa clan. +10% speed, +15% experience gained. 32. The Gold Six - The six heritage gems from the First Emperor focused on good. +3 Karma everyday, +5,000 gold per hour. 33. The Golden Fragments - Fragments of the Daimyo monument itself. +4 Karmapoints every day, +7500 gold per hour. 34. The Black Six - The six heritage gems from the First Emperor focused on evil. +75 power per ninja. 35. The Red Six - The six heritage gems from the First Emperor focused on life. +35% health. 36. The Obsidian Fragments - Bits of the Obsidian foundation of the Daimyo monument. +75 power per ninja, +10% critical. 39. Ring of Strength – An ancient ring lost by the strongest clan to battle near here. +10% power. 40. Polished Shell – The shell of a mysteriously healthy sea creature. +10 health per ninja. 41. Totem of Wealth – A valuable totem bestowing wealth on it’s owner. +700 goldper hour, +5% gold won. 45. Halves of Life - Both halves of a long lost vitality emblem. +80 health per ninja. 47. Talisman of Nerdly Prowess – Proof of your mastery of the art of Konami, the ancient up up down down ritual. +10% attack speed.